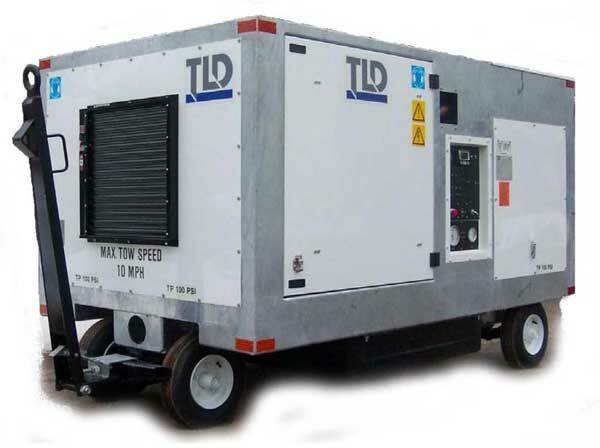 The TLD ACU-2075 trailer mounted aircraft heating unit delivers 750,000 Btu/Hour of preconditioned air (clean, pressurized, heated) to any single-aisle commercial aircraft with a standard 8-inch (203mm) PCA connector. The unit provides filtered and heated air in two operating modes: In the passenger comfort mode, the unit assures optimum cabin temperature in all ambient weather conditions. In the technical heating mode, the unit eliminates plumbing system drainage during layovers when ambient temperature falls below freezing. 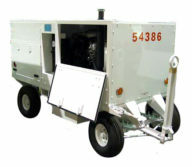 The gasoline engine supplies the thermal and mechanical energy required to operate the heating system. Surplus thermal energy produced during combustion and absorbed by the cooling system is transferred to supply air preheated through compression and forced through the liquid coolant heat exchanger by the blower fan. The resulting preconditioned air, unexposed to by-products of combustion is contaminant-free. The recovery and use of engine waste heat makes the ACU-2075 an energy efficient unit. The design is inherently safe through its avoidance of an open flame.